The beginnings of the discussion list ROOTS demonstrated that sometimes genealogically related information visually is presented much better than in words. Some original publications or documents that the holder not fully understand, or desire to discuss in some details or simply wish to show to fellow researchers for deeper knowledge of the life of times past etc. can be made available as scanned photographs or texts.. This page is meant for the publication of this kind of information, if it was find not corresponding to the other pages of the Site. After some time it will be deleted from the Exposition. Some researchers propose also the materials that fully correspond to the principles and to the concept of ROOTS=SAKNES and can be built into the Site quite logically. This information needs more work to prepare it for publication and will be published in its turn. The obituary of Nikolajs Bērziņš (1878-1932) published in the newspaper "Ziemeļlatvija" on June 11, 1932. (In Latvian) The text is made available by Neil Foley from Australia who is the husband of N.Bērziņš granddaughter. People with additional information about N.Bērziņš may contact Neil in the discussion group ROOTS or directly by the adress foley129?ozemail.com.au Please, change ? to @ in this address, if really mailing. Inscription This is the inscription on a postcard with photographs of Stephen Bylciw's grandfather and his (grandfather's) mother. Stephen has problems with the translation. Cemetery Ilze Z. asked the newsgroup if Vērpju kapi near Dobele still existed. Here one may link to a fragment of the map (1998) of Dobele rajons with Vērpju kapi mentioned. The cemetery is in the centre of the picture. Nowadays a lot of maps are printed but not all of them present information about cemeteries. This is another photograph from Stephen Bylciw's family archive. The text on the backside and the picture on the frontside are analysed. The Page contains also files with the Census and other information about Kārlis /Alksnis family. 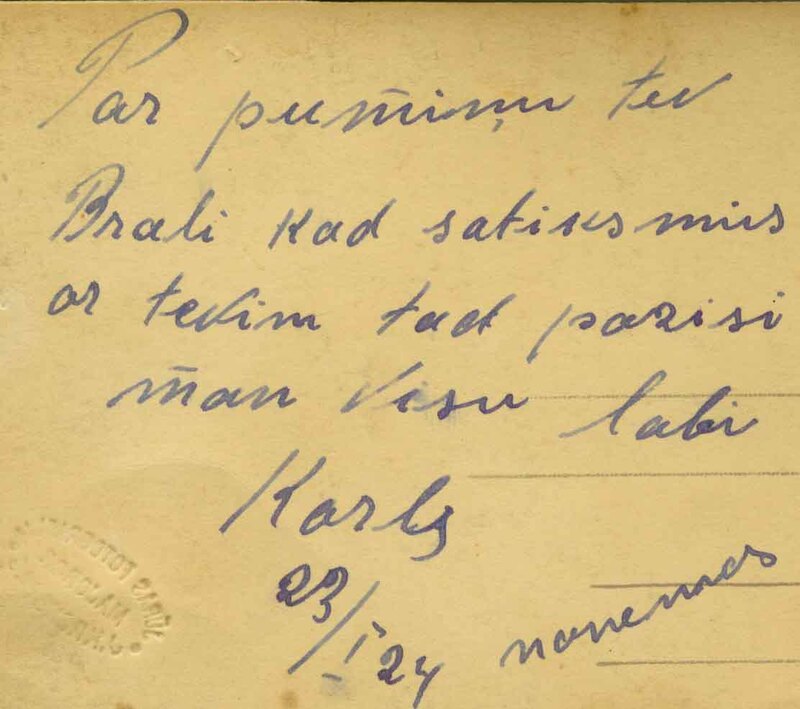 K.Alksnis letter This a letter of Kārlis Alksnis to his brother August in US. The people knowledgeable in Latvian are invited to read the text. Smiltnieks The picture ot the document that Lucille le Roux in South Africa has. It concerns her grandfather Jacob Christian Smiltnieks (1878-1958) who migrated to South Africa before 1899. What conclusions can be drawn from this document? Trīne Graumanis A fragment of a map of the vicinities of Lielelejas manor where Trīne Graumanis lived and worked in 1870s.